Skilled in the identification of pollen grains and fungal spores in peat and in lake deposits, and in environmental forensic trace evidence, Judy wrote the identification section of what is still the standard text on pollen identification, Pollen Analysis, Moore, Webb & Collinson, pub. by Wiley-Blackwell, latest edition 18 Aug 1994. Member of the Floodplain Meadows Study Group of the Ashmolean Natural History Society of Oxfordshire, which monitors flora, soils and hydrology. First contact via PTES for verification of the extremely rare Orchard Tooth fungus, Sarcodontia crocea. Helping with maintenance work at Abingdon Green Gym in Frilford Heath Ponds & Fens SSSI. Coordinator of the Friends of Milham Ford Nature Park conservation working group. Records Officer and committee member of the previous New Marston Wildlife Group (dissolved 30 March 2015). Judy was awarded a 'Freshwater Champion' certificate by the Freshwater Habitats Trust in recognition of 'the time, effort and dedication' she has given to the Trust's People, Ponds and Water project. She also received £25's worth of book tokens. A close-up of the certificate can be seen with other photos taken in the Lye Valley on 7 March here. Any captions added to photos can be seen in full by clicking on the white circle with an 'i' in it at top right of photo, after clicking on a photo to get to slideshow view. At a presentation in Oxford Town Hall on 19 June, Judy was one of 12 people who received a Certificate of Honour, an award given to individuals who have carried out exceptional voluntary work in Oxford City. All nominations are considered by the Lord Lieutenant of Oxfordshire, Tim Stephenson OBE, the Lord Mayor of Oxford, Jean Fookes, and the Director of Oxford Community and Voluntary Action (OCVA), Kathy Shaw. For the citation read out at the ceremony, click here. For the official group photo, click here. The Lord Mayor of Oxford, Jean Fookes, and the Sheriff of Oxford, Cllr Mohammed Altaf-Khan, also presented certificates. The photo (one of the official ones taken of the event) shows Judy receiving her certificate from Lady Helen Baker, a Deputy Lieutenant for Oxfordshire. 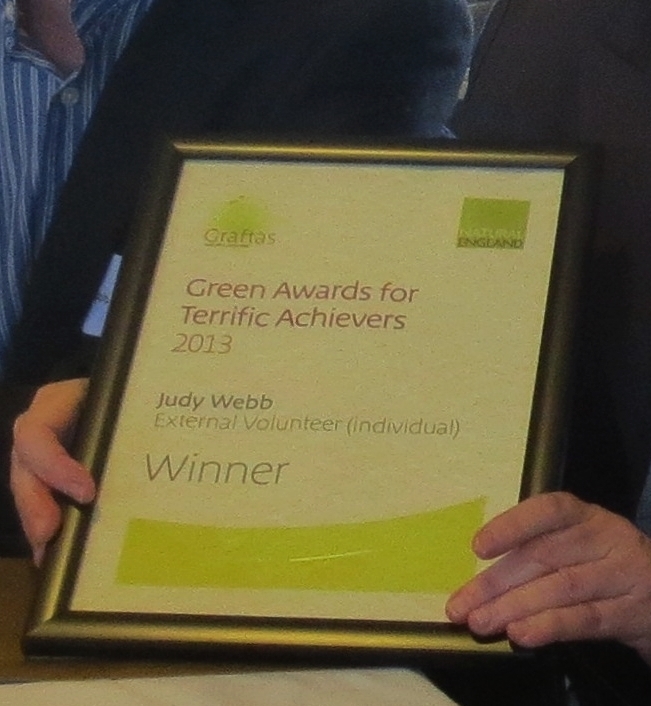 To see the Natural England report and a photo of Judy receiving her award from its Chairman, Andrew Sells, click here. Natural England acknowledges that Judy has "added many new ‘notable and nationally scarce’ records to the reserves lists and shared records with the County Records centre. These records directly help nature conservation and improve how habitats are managed". In a previous posting on the Natural England website Judy is complimented for setting "a very high standard for biological recording" and making "a huge contribution to our understanding of the sites she is involved with". Judy was one of the contributors to The Flies Workshop, a Radio 4 programme about work done by members of the Dipterists' Forum (one in the series 'Bitten by the Bug') broadcast on 11 October 2011. The programme is still available on the BBC iPlayer - click here. The first interview with Judy starts about half way through the programme, at the 07:20 mark and the second at 11:28.